Five months after the last alpha, NixNote 2 beta is finally available for download. 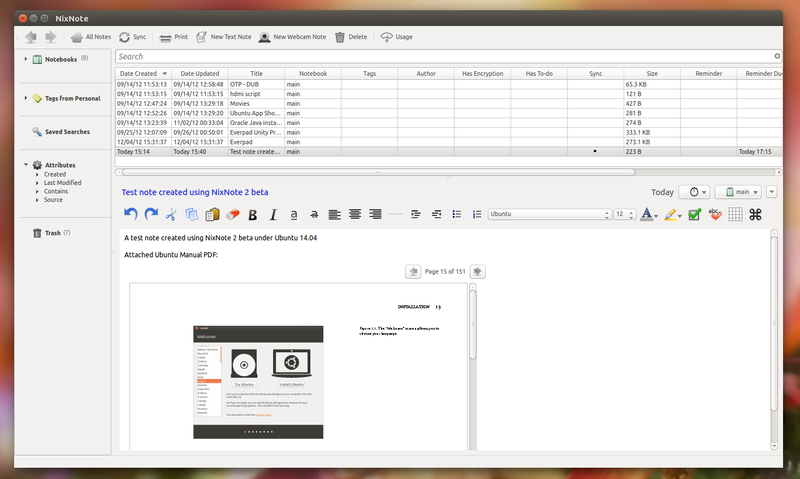 NixNote, previously known as Nevernote, is an unofficial Evernote client for Linux which was initially written in Java. NixNote 2 is a complete rewrite of NixNote in C++ using the Qt framework, having speed and a reduced memory footprint as the main goals. Java is still used for encrypting / decrypting text in NixNote 2, but it's optional so you don't have to install it if you don't need this feature. Evernote is a note-taking service that supports saving text, full webpages, voice memos, video notes and more with a lot of useful features. There are official Evernote clients available for Windows, OS X, and mobile platforms but not for Linux. deb, rpm and tar.gz (with install script) available for download. Unfortunately, some features from NixNote 1.x are not yet fully implemented (they may not be implemented at all), like synchronizing note colors or selective notebook sync. Also, encrypted databases won't be supported in NixNote 2. For more information on NixNote 2, including known issues, see the Beta 1 downloads page. Download NixNote 2 (deb, rpm and tar.gz files available for download). Ubuntu users: The deb files work in Ubuntu 13.10 and 14.04 only (it won't work in Ubuntu 12.04 or 12.10 due to the required dependencies which aren't available in older Ubuntu versions)! It's also worth mentioning that syncing with Evernote is disabled by default. To enable it, from the NixNote 2 menu select Edit > Preferences and enable syncing on the Sync tab. Then select Tools > Synchronize to start synchronizing NixNote 2 with Evernote.